HAPPY NEW YEAR! WE WILL HAVE A NEW SERIES OF YOGA CLASSES STARTING FEBRUARY! PLEASE NOTE OUR NEW LOCATION AT PEOPLE'S PLAZA, AND, ALSO THAT OUR SAT CLINIC WILL BE CLOSED ON Jan 19 for Martin Luther King Day; Feb 16 for Presidents' Day and Apr 20 for Easter Weekend. Currently, Herban Health is only having a drop in Acupuncture clinic at Ravenswood Family Health Center (Note new location below) on Saturday mornings, we hope to add more regular one-on-one or small group sessions in the future. For the year 2018, we are planning some classes on healthy eating and exercises & movement. The classes will be taught in both English and Spanish. If you are interested in the above activities, please call 650-327-7894 to leave your name and contact information. 1. Please no children in the clinic for safety reasons unless they are being treated. 2. No one will be treated if arriving after 11:15, but if too many people are remaining to be treated by 11:00, we will need to turn people away. 3. Patients are expected to eat before they come. 1. Please eat before you come. 2. 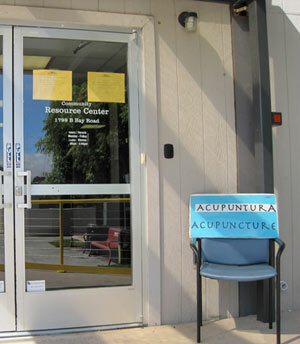 At the first visit, new patients will receive a brief introduction to acupuncture and will be asked to fill out paperwork. There will be a limit to the number of new patients we will take for the clinic depending on the total number of patients and practitioners present that day. 3. People will be treated in the order of their arrival. Depending on how many people are already waiting and the opinion of the acupunturist, the first acupuncture treatment may be mainly ear acupuncture, or earballs to address their main health concerns. to find us, Just look for the blue sign! Do you want a class that we don't yet offer? Herban Health offers a variety of holistic health classes on topics including diabetes, digestive problems, stress reduction, insomnia, children's health, exercise, stopping smoking, losing weight, and high blood pressure. If you are interested in a holistic health class or service that you don't currently see on our schedule, please let us know and we will work to provide it! Also, we would be happy to talk with you about providing a class at your church, school, or neighborhood organization. Our mission is to provide the classes that you want, so please let us know! We offer our services freely and by optional donation only. Everyone is welcome! Copyright © 2012 Herban Health.